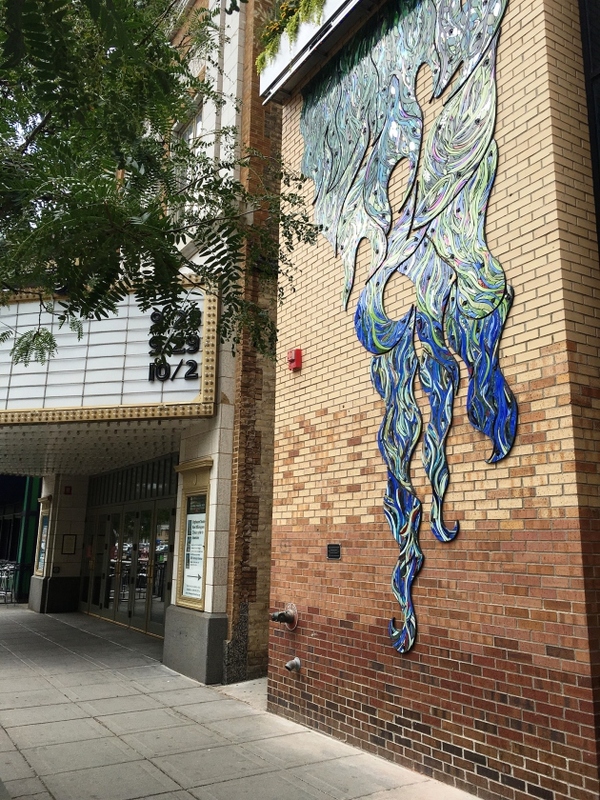 In late July, the Hennepin Theatre Trust, which runs four theaters in Minneapolis' entertainment district, announced that it was purchasing the building that formerly housed the Solera restaurant. The structure adjoins the Orpheum Theatre. Six weeks later, the Trust is unveiling a mural and garden project on the building. It's all part of a branding and beautifying effort, led by the trust with its partners, to make downtown Minneapolis an attractive destination. The 25-foot mural, described as a "vertical mosaic garden," faces east on Hennepin. The floral-themed mosaic mural was designed by trust staffer Bailey Cahlander (who also shot this photo). Above that mural is a living garden over vines and evergreens in window box-style planters. The flora will be framed by three rows of changeable LED lighting. A public celebration will be held Thu. at 6 p.m. at the site, 9th & Hennepin.